As I continue to seek out products designed with the miniature wargaming hobby enthusiast in mind, I've discovered yet another company that offers acrylic paints designed for miniature models. Derivan is an Australian company. 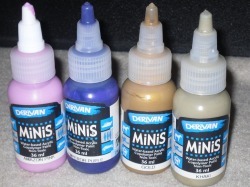 Their paint line is called Derivan MiNiS. They claim that their paint is an acid-free, archival-quality acrylic paint that has been scientifically formulated for model and miniature painters. There's 72 colors in the line in all, and is a water-based and non-toxic acrylic paint as well. I was sent a few bottles to review from the US distributor of Derivan MiNiS, Scale Creep Miniatures. The first thing I noticed right off the bat is that these are huge bottles. Derivan MiNiS paint come in 36ml eye dropper-like bottles, and instead of a cap, the tip of the bottle twists to open and close it. Actually this is almost the same mechanism you'd find on an Elmer's white glue bottle. So there's no cap, or threads to gunk up with paint, which is a plus. I was sent a rather odd assortment of colors to work with, so it was a challenge to review this line, because I have next to no use for 36ml of Amazon Pink, or Emperor Purple. I wasn't about to let that stop me, and in the end I found quite a few female figures to paint with those shades. The other two colors I was sent to review are Gold and Khaki. The consistency of this paint is a little thicker than Vallejo and Reaper Master Series. It thins down further quite well too. Although the Amazon Pink was really tough to work with over black primer. I have similar light colors that cover black primer in a single coat from Vallejo and Reaper, but the Derivan MiNiS Amazon Pink literally took 5-6 coats. The Khaki did a little better, as I was able to cover black primer with it in about 4 coats with it. This stuff just doesn't offer the same coverage as what I can achieve with Vallejo or Reaper Master Series, which are both thinner than Derivan MiNiS. What I can achieve in 2 coats with Vallejo or Reaper takes 3-4 coats of Derivan MiNiS paint. At first I was thinking that maybe the medium settles at the top, and I was getting more medium than actual mixed paint. Therefore I've tried shaking the bottles madly. I've even attempted to store them upside down for days, and then I shook them up and used them again. That didn't help either. It was time for a different approach. I unscrewed the tip from the bottle, and began to use paint from the bottle itself direct. This yielded a better mixed product than the tip alone. It seems that the tip ends up trapping unmixed paint, which is more medium than pigment. Granted you still need to shake them vigorously to mix them properly, but clearing that tip is essential. It also might help to toss some bearings in the bottle to help with mixing of the paint, because this stuff really wants to separate. My coverage results didn't change much with non-metallic colors, they would just stick more, instead of smear now, but I was able to actually make use of the metallic Gold now direct from the bottle minus the tip. At first the gold was useless to me altogether. It was even thinner than the non-metallic colors I had to work with. This was after the bottle was upside down for days, and then shaken madly. It looked literally like water with some glitter mixed in. All I could do with it was smear it all over the place, as I couldn't get it to stick to cover anything. My models were primed with everything from Armory Black primer, and Army Painter Matte Black primer to brush on black primer from Reaper. No matter what surface I tried, the results were the same. Taking the tip of the bottle off and clearing it out, and then using the paint from the bottle itself yielded a different result. Using the Gold paint direct from the bottle, it too would stick and not smear now. The consistency looked more like acrylic paint now too. Granted I still don't feel that their Gold is as good coverage-wise as Vallejo or Reaper, but it's definitely a decent metallic paint, especially for the money. Despite the trial and error chaos, once I was finally able to use the Derivan MiNiS shades to paint many miniatures with, the end result was just about as nice as what I could achieve with any other paints I use at present. The finish is very matte, almost chalk-like in appearance, which I wasn't used to. The big difference is, it still took more coats of paint with Derivan MiNiS, and it slowed the entire process down in doing so. I can't say that I'm convinced enough to use Derivan over Vallejo Game Color, Reaper Master Series, Formula P3, GW, or Coat d'Arms. 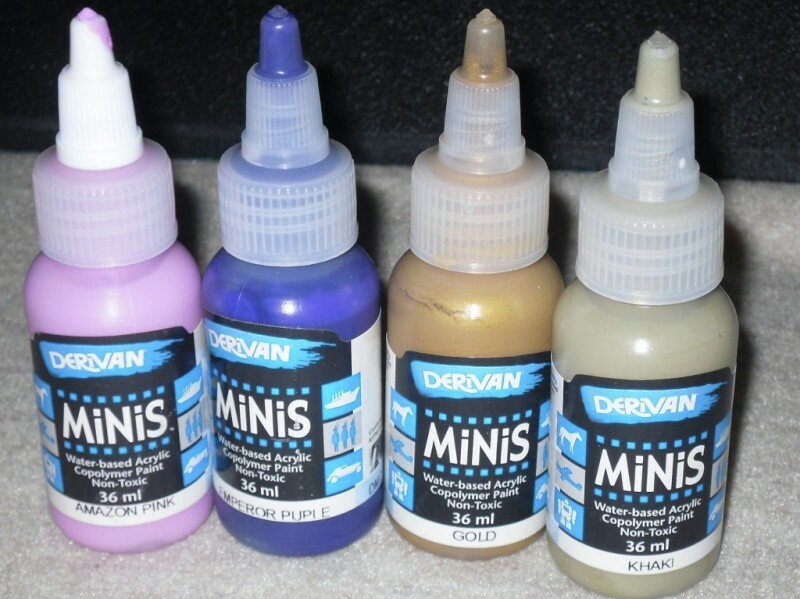 I think the Derivan MiNiS colors are better than the alcohol-based acrylics from Tamiya, and all of the craft store paints out there, but it lacks the coverage I've grown accustomed to from the other brands I use. This stuff also takes some trial and error to end up with the right consistency to work with, and the medium and pigments separate far too much for me to appreciate it more. I prefer the convenience of how ready to go other options are right from the bottle with a simple shake and nothing more. Using this stuff seemed like work to me. I've also read conflicting views on the topic of Derivan, as others have claimed to achieve great coverage with it, and that they appreciated it more than GW and other brands. I personally didn't see it that way, but I'm just one man, with one view. I certainly don't see Derivan MiNiS as a bad paint product, but my experience with it leads me to believe that what I'm using already is the best option for me. To clarify, I'm not one to lay down 4-6 thin coats if I can get the job done in 2-3 coats. Therefore the Derivan MiNiS colors may very well be a good option, if you're a painter who prefers to work with multiple thin coats. One thing is for certain, for the money the Derivan MiNiS line is one of the most affordable water-based acrylic options out there. A single Derivan 36ml bottle yields 3x the amount of paint you get from GW's 12ml pots, and 2x what you can get from Vallejo and Reaper 18ml dropper bottles. The bottles are also nice. I wish Vallejo and Reaper utilized these bottles, because I really like the twist open tips. The only thing I don't like is how the tips can trap unmixed product in them. Although if you needed a specific color, for a rather small project, it wouldn't be cost effective to go with Derivan MiNiS, especially if it was an odd color like a specific shade of pink or purple. Therefore the 36ml bottles are a catch-22. The big 36ml bottles are great if there's a color you really need, and will use a lot of, but not so great if you need an odd shade just to finish a special model or two. I have 18ml Vallejo bottles that will last me a lifetime as it is, because they're shades I rarely use. I can't imagine buying those shades in 36ml bottles. Just a few days ago Scale Creep Miniatures slashed prices on the entire Derivan line. This is a permanent price drop, not a sale. The non-metallic shades are $4 USD per 36ml bottle, and the metallic shades are just $5 USD per bottle. 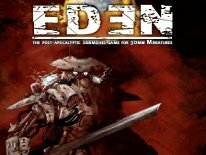 At those prices the Derivan MiNiS line might be worth checking out for yourself.